EXPLANATION: “Ntoboaseɛ ne anidahɔ na wɔtumi de yɛ ade kɛseɛ” – Success follows patience. About three years ago I promised Twi learners that I would release a much better version of Twi Primer (my PC and Mac Twi app), for the iPhone and iPad. About a month ago I did just that and quietly released Twi Primer for iOS. Twi Primer is meant to introduce non-Twi speakers to the written and spoken language, and help them acquire it better and faster than traditional learning materials such as books and audio tapes. There are fifteen beginner to intermediate topics in Twi Primer. Each topic is made up of three sections including Tutorial, Vocabulary and Challenges. 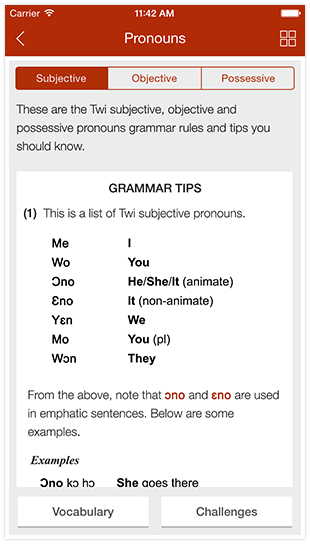 In the Tutorial section, Twi parts of speech and grammar are introduced with simple tutorials and examples. You learn the rules, tips and tricks of each part of speech from here. The two buttons, Vocabulary and Challenges, at the bottom of the Tutorial section take you to the Vocabulary and Challenges sections respectively. 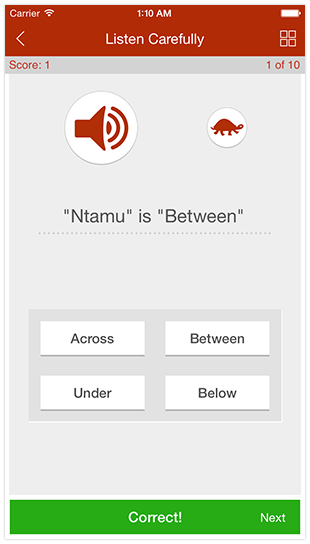 The Vocabulary section helps to build your Asante Twi vocabulary. Tap Vocabulary after reading the tutorial to present the words you need to know and include in your vocabulary. To listen to a word, you tap the speaker button. It’s important to play, listen to and repeat all the words after the native speaker. This will help you to memorize them and improve your pronunciation. 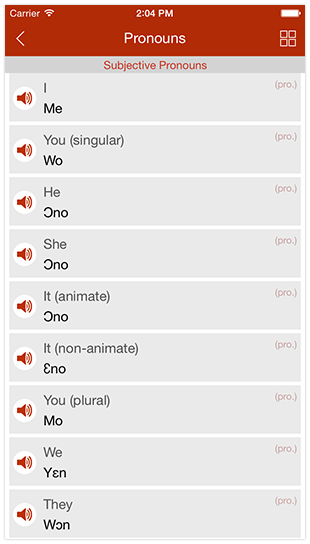 To further improve your pronunciation, tap the word to open the Pronunciation screen. You can play the word at normal speed or slower to clearly hear all of its syllables. You can also record and compare with the native speaker. You will even see and hear an example of how the part of speech is used. In the Challenges section, you have to finish two challenges, Fill the Gap and Listen Carefully. The Fill the Gap challenge tests your Asante Twi reading skills, while the Listen Carefully challenge tests your listening skills based on the knowledge you acquire in the Tutorial and Vocabulary sections. You tap the Challenges button in the Tutorial section to start a challenge. 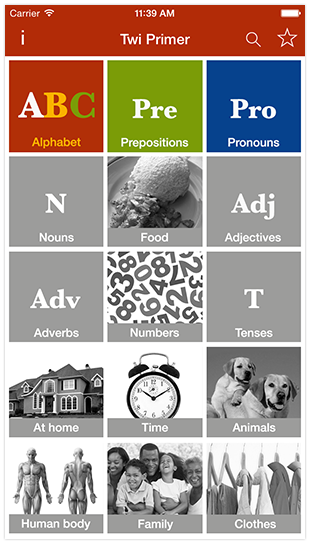 When you start using Twi Primer you will notice that all the topics except Alphabet and Prepositions are greyed. They are locked. To start learning Pronouns you need to finish learning Prepositions and complete its challenges to unlock Pronouns. This makes sure that you master a topic thoroughly to build on it with new information in the next topic. It’s very satisfying when you gain a badge. Each challenge has three testing levels. 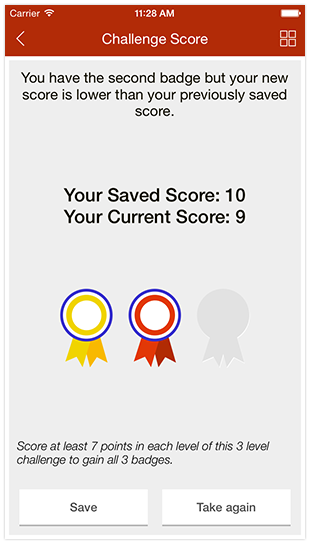 Score at least 7 out of 10 questions in each test to gain a badge. 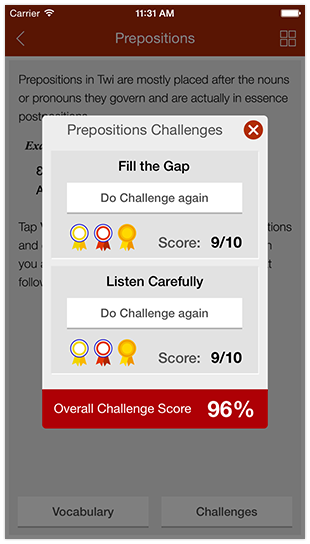 You have to gain 3 badges in Fill the Gap and 3 badges in Listen Carefully under each topic to unlock the next topic. With Twi Primer for iOS, you’ll learn better and faster Twi than using a book or just audio material, because you have the ability to control the speed of your learning, test your competence and have fun at the same time. In conclusion, if you have an iPhone or an iPad and you seriously want to learn Asante Twi you shouldn’t look anywhere else but to download Twi Primer for iOS. Posted on January 26, 2015 by Nkyea. EXPLANATION: “Ɛyɛ sɛ akwantufoɔ bɔ anan nante” – Friends on a journey should always move together. 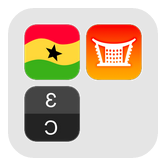 We just released the Complete Asante Twi Bundle in the App Store. This bundle includes the only three essential apps that’ll help you to quickly learn to understand, speak and write better Asante Twi. 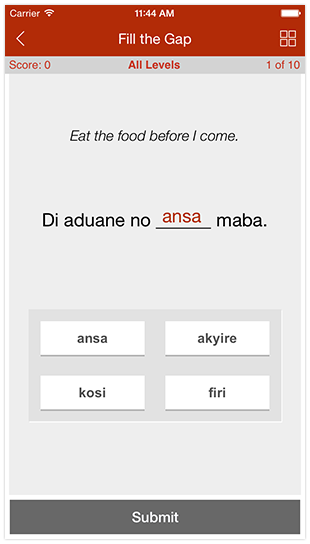 The three apps are like friends on a journey to help you learn Asante Twi so, you must pick the three together. 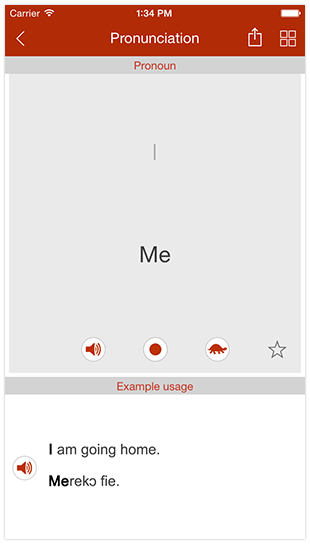 Nkyea Twi Phrasebook – The premier Twi language talking solution for handy communication that includes more than 3600 words and phrases for everyday situations. Twi Primer – The most comprehensive course in Asante Twi that teaches you, in detail, Twi grammar and vocabulary and tests your understanding with interesting challenges. Nkyea Keyboard – The best general-purpose keyboard with an English-to-Twi translator of more than 10,000 words that helps you to type better Asante Twi. If you buy them separately you’ll spend $6.97 so, Get the bundle today for only $5.99 and start accomplishing your resolution of learning Asante Twi in 2015. Posted on January 17, 2015 by Nkyea.